Ray Smith announced via Twitter he will no longer play basketball. Arizona forward Ray Smith said today on Twitter that he will end his basketball career after the Arizona Wildcats confirmed that he tore an ACL for a third time on Tuesday. UA said Smith injured the ACL in his right knee in an exhibition game Tuesday against the College of Idaho, as well as suffering other ligament and meniscal damage, and that he will have surgery in the upcoming month and begin rehabilitation. Smith said in his tweet that "sometimes in life all you can do is the best that you can do," and that the "6-8 long athletic wing who can play multiple positions is out." Smith has now torn his right ACL twice and his left ACL once, all since 2014. He first tore his left ACL while playing travel ball in July 2014, committing to UA just a few days after the injury, then rehabilitated throughout his senior year at Las Vegas High School. Smith was cleared to play in October 2015 and appeared in the Red-Blue Game, but tore his right ACL in practice five days later and missed all of his freshman season in 2015-16. Smith was then cleared again to play in late September and practiced for over a month, playing in the Red-Blue Game before he was hurt in Tuesday's exhibition game. Smith went up awkwardly during a layup attempt and had to be helped off the court with his legs off the ground. 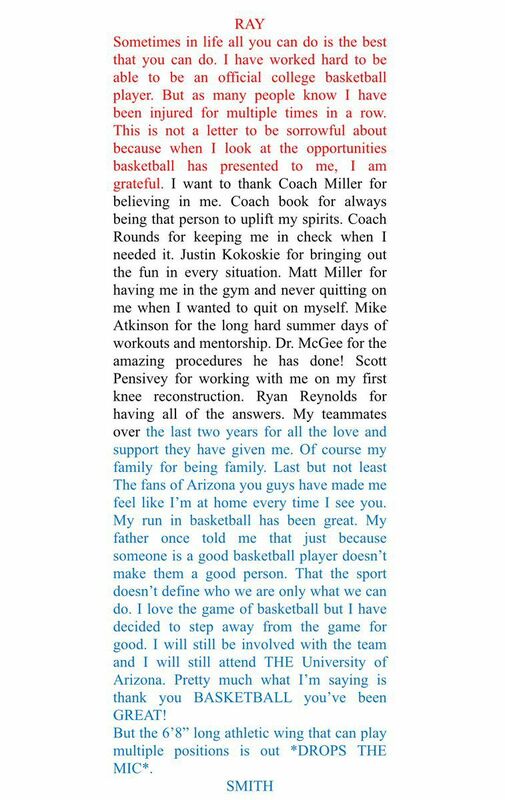 UA coach Sean Miller, who has often spoken highly of Smith's work ethic and personality, issued a long and emotional statement. "In the 25 years I have been a college basketball coach, I have never felt as helpless as I did when I saw him go down on Tuesday night," Miller said in his statement. "No 19-year-old kid should have to experience three season-ending injuries in a 30-month period of time. I have watched Ray work with our strength and conditioning coach tirelessly for two years. I have seen him in our training room around the clock, doing everything he can to play the game he loves. To witness his extraordinary efforts and see this happen to him once again is beyond disheartening. Smith issued two tweets late Tuesday night thanking fans for their support but also offered some perspective. In his tweet today, he thanked fans, teammates, coaches and doctors. "I have worked hard to be an official college basketball player," Smith said. "But as many people know, I have been injured multiple times in a row. This is not a letter to be sorrowful about because when I look at the opportunities basketball has presented to me, I am grateful." Smith's departure leaves the Wildcats with nine healthy scholarship players, though only seven are currently active because of Allonzo Trier's pending eligibility issue and Chance Comanche's indefinite academic suspension. Arizona is scheduled to host Chico State on Sunday and open the regular season on Nov. 11 against Michigan State in Honolulu. Injured again Tuesday, the Arizona redshirt freshman says he's a "blessed man." Injury to Ray Smith, issues surrounding Allonzo Trier, Chance Comanche will force UA to change rotation, game plan. Seen and heard at McKale Center during Arizona's 86-35 win over College of Idaho. Hansen: Was Tuesday the worst day in Arizona basketball history? David Holdbrooks attended, spoke at Wright's memorial service. 'He played the part,' Wright's ex-coach said.